The power of Instagram Stories really comes to life at 10,000 followers. Because at this point, an influencer can induce the swipe-up function. Moving beyond views and impressions, this is now allowing influencers to have a better call-to-action in their stories and encourage better engagement with your brand. The consumer can now not only view their favourite influencer’s outfit of the day, they can swipe up to shop it straight away. Unlike posts in feed which don’t support hyperlinks and therefore force influencers to have one sole link in bio, the story links allows immediate action. Removing any complication and additional steps to get clicks means a much higher click-through-rate. 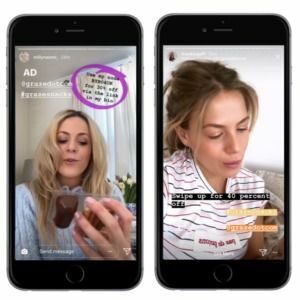 Some brands can be wary of using Instagram stories due to their sometimes informal and unpolished formatting, however, this is why we think they work so well. The authenticity of a story is what makes product placement so effective as the product or service can seamlessly fit into the lives of the influencer. When someone is genuinely showing off something that is a part of their lives, it increases the authenticity of the collaboration. It demonstrates that the influencer is using the product themselves as a part of their daily life. his is probably one of the best features that brands can take advantage of on social platforms. We use it throughout many of our campaigns to support event attendance, drive fashion sales or even increase footfall in store. Just check out our Graze Campaign which solely used Instagram Stories to get people to make healthier snack choices.